A part of the Palakkad district in Kerala, in the foothills of the Western Ghats, Malampuzha has a tremendous amount of dense green plants. The stunning green foliage of this place creates a serene and offers a surreal experience to everyone. One of the biggest attractions of this South Indian city is an irrigation dam that was built in 1955. The irrigation dam is responsible for making the landscape green and fertile. Tourists are drawn to this area due to its natural beauty and salubrious climate. A wide variety of amusement opportunities exist in this region. The region is teeming with both natural & man-made gardens and reservoirs for everyone. Palakkad Junction is the nearest railhead to Malampuzha. It is located around 7 kilometers away from Malampuzha. It is an important railway station which is well-connected to major cities in India such as Bangalore, Chennai, Mumbai and New Delhi. Taxi cabs ply between Palakkad and Malampuzha. Coimbatore Airport is the nearest airport to Palakkad. It is located around 55 kilometers away from Palakkad. Cochin International Airport is the nearest major airport, which is located around 147 kilometers away from Palakkad. Cochin airport is well-connected to major cities in India such as Bangalore, Chennai and Kolkata. The National Highway 7 and National Highway 47 connect Bangalore and Malampuzha. The journey via road from Bangalore to Malampuzha will take around 6 hours. Private tourist buses serve as a link between Tiruchy and other major cities such as Bangalore, Chennai, Madurai, Kanyakumari and Trivandrum. Malampuzha is well-connected to other cities in Kerala and Tamil Nadu. Deluxe tourist buses ply between Palakkad and other major cities such as Bangalore, Cochin, Trivandrum and Chennai. 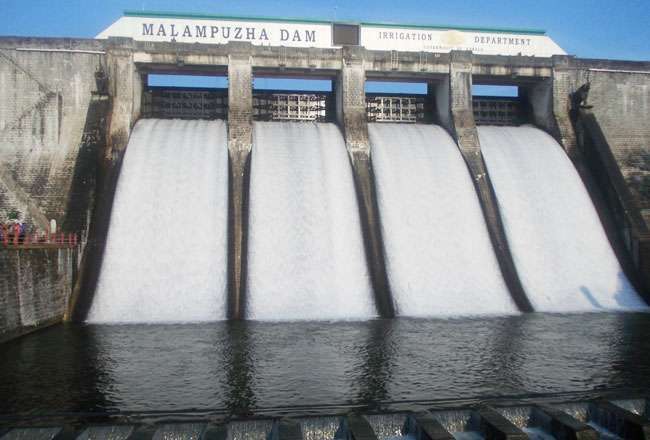 The construction of Malampuzha Dam was completed in 1955 and is spread over 115.06 meters. With a huge chain of canals, the dam has created the biggest irrigation system in Kerala. The dam is located in the Western Ghats with the Ghats mounting over the reservoir. The Malampuzha Garden is located next to the dam. The reservoir created by the dam is used for boating by many tourists. Fondly referred to as the ‘Vrindavan of Kerala’, Malampuzha Garden is a combination of Western Ghats blended with the serene water of reservoir created by Malampuzha Dam. The garden features several green lawns, impressive flower beds, relaxing fountains and gorgeous beds. The garden offers pedal boat rides on a man-made canal. Touted as South India’s first Rock Garden, Rock Garden is located amidst the magnificent surroundings at Malampuzha. This Rock Garden was sculpted by the World renowned Padmshree Nekchand of Chandigarh. This garden is quiet impressive and a perfect place to sit and think about life without any commotions. Located in proximity to Malampuzha Dam and Malampuzha Gardens, Snake Park is a snake rescue and rehabilitation center. It is a safe place for snakes to get help for injuries and a great place for tourists to see snakes from close quarters. There is nothing amateur about this park and is managed by the Forest Department. Several varieties of poisonous and non-poisonous snakes can be found in this snake park. Situated in proximity to the Fantasy Park of the Malampuzha Garden, Thread Garden was built with the assistance of Antony Joseph. The garden has a diverse collection of flowers and plants. These plants and flowers have been designed by using colorful stitching threads and were woven by hands.